An exhibition titled "One nation two states" by Turkish Cartoonist Alp Gurhan Yalciner was opened in Baku on December 20. 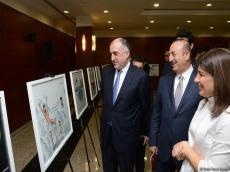 Co-organized by the Turkish Embassy in Baku and International Turkic Culture and Heritage Foundation, the event brought together officials, MPs, cultural figures, including Azerbaijani Foreign Minister Elmar Mammadyarov and Turkish Foreign Minister Mevlut Cavusoglu, Azertac reported. Addressing the event, Mammadyarov highlighted the steadily developing bonds between the two countries. The minister spoke about projects carried out by the International Turkic Culture and Heritage Foundation and stressed their importance. Cavusoglu praised development of fraternal and strategic bonds between Azerbaijan and Turkey: “Both countries will also continue to develop cultural relations. The relations with Azerbaijan are very important for us." He also stressed successful representation of the International Turkic Culture and Heritage Foundation in international arena. President of the International Turkic Culture and Heritage Foundation Gunay Efendiyeva spoke of the historical-cultural relations between the two brotherly countries. Touching upon the activity of the Turkish artist, Efendiyeva stressed that the exhibition is a vivid evidence of fraternal ties between both countries. She noted that the International Turkic Culture and Heritage Foundation is ready to contribute strengthening the unity among the Turkic speaking countries. Turkish artist Alp Gurhan Yalciner said that he is trying to show friendship and fraternity relations between the two countries in paintings by children. The artist thanked organizers for holding the exhibition.